“Where a school is located and how it sets up internal structures determine its possibilities”, writes Heidi Hayes Jacob in the book Curriculum 21: Essential Education for a Changing World. As she argues in this book, we have inherited spaces in our buildings that were designed for learning of another era. Tearing down and rebuilding our schools is hardly a tasteful option in an era of tight budgets and a total lack of funding. What can we do then? We can start by redesigning our classrooms from places where “knowledge is imparted” to more of place where knowledge is found, discovered in a collaborative manner. We can turn the physical environment into places where authentic learning is the classroom business, not sitting in rows, listening to lectures. This may mean simply getting rid of desks and moving in tables and chairs that are portable and can be rearranged quickly according to the needs of the students and the teachers. It means we can change our physical spaces in our schools into 21st century learning environments without breaking our budgets. Full Text: The 21st Century Principal: Turning Your Classrooms into 21st Century Learning Spaces. Has the time come to stop using the term 21st Century Learning? It has been the passionate rallying call for change in education for more than a decade and has challenged many of us to rethink the context and culture of learning in this century as significantly different from the previous one. Now that we are more than 10% into it, our use of 21st Century in terms of learning, education, schools, pedagogy now needs to cease. We can’t keep using it forever. One eighth of the 21st Century is behind us, it is time to move on. Over the past 12 months I have been resisting using the term when I speak or write, yet succumbing from time to time as it succinctly describes what we are talking about. Full Text: I think the time has come to stop using the term 21st Century [education context] & become authentic #RIP21stC « Anne Knock: Learning everywhere today. How long do we have to be in the 21st century to say we are 21st century teachers? Everything has changed because of the Internet. Schools are going wireless, using interactive whiteboards, flipping the classroom, putting in 1:1 solutions — some are even BYOD (Bringing Your Own Device). I see exciting technology yet rarely see innovative teaching and learning. I don’t mean to be harsh here, but I read Med Karbach’s What Does It Take to be a 21st Century Teacher? and thought I need to write something. It’s all about a culture shift. It’s not just the technology. It’s a mindset. This image says it all to me. It is all about each learner and their own learning potential. Do we tap into it? Teachers mostly teach the way they have been taught. To move to a more collaborative learning environment involves all stakeholders. One teacher in a school can move desks around, have students create learning plans, but this is a whole culture shift that needs to happen. Full Text: Get ove it! The 21st Century is Already Here | Rethinking Learning – Barbara Bray. As I was wading through DawsonIt website, which is a great website for teachers interested in educational technology, I came across an article entitled 3 Informational eBooks for Teachers and Educators. As I clicked on the the title I was directed to the original website where the 3 eBooks originated. It is called Learning Today which is also , to my surprise, another great resource for teachers. I spent some time leafing through its content and I ended up selecting for you one ebook and a video presentation. The first is great guide for teachers on how to integrate technology into education and the second is a presentation about the use of podcasts in education. Full Text: A Great Guide on How to Effectively Integrate Technology in The Classroom. People toss around terms in education and attach the words “21st century” to appear cutting edge or on the front end of trending ideas. As a teacher in the 21st century, I find it amazing to see some of the things that are so-called 21st century and yet are no different from ideas from the 20th or even the 19th century. 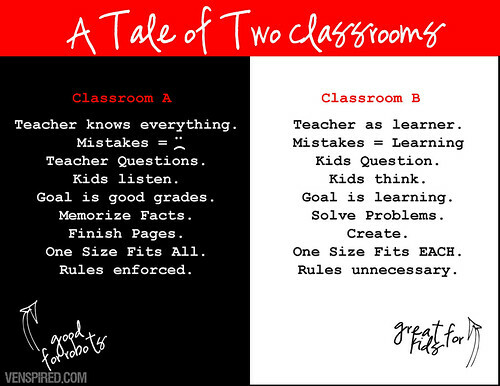 With that in mind, I reflected on what it takes to be a teacher in the 21st century and what such a teacher looks like. Obviously, a 21st-century teacher should be tall, handsome and have a sweet spot for superheroes. Beyond that, I think there are some key characteristics that good 21st-century teachers need. Full Text: What is a 21st Century Teacher? | Lemon Frog Learning. Teaching and learning in the 21st century needs to be ‘turbo-charged’ by educational technology rather than using technologies designed for other purposes, according to a new report developed by the Technology-Enhanced Learning Research Programme (TEL) – a five-year research programme funded jointly by the Economic and Social Research Council and the Engineering and Physical Sciences Research Council. The report, ‘System Upgrade: Realising the vision for UK Education’ is the work of academics, industry and practitioners from across the UK and warns that to prosper in the 21st century, people need to be confident digital collaborators and communicators, discerning users of the internet, and equipped with computational thinking skills such as understanding how to use and write the computer programs that underpin emails, searches and maps. Full Text: ‘Schools need to engage the Xbox generation’ – News – Education Executive. What teachers need to consider when preparing students for the 21st Century. An exciting one-day conference for educators, including K-12 teachers, higher education faculty, college students and other learning practitioners to develop and exchange best practices in teaching and learning. Presentations will include hands-on workshops and research-based current strategies to engage your 21st century learners! Details: This event will also offer a host of break-out sessions geared towards engaging the 21st century learner. CEUs: Presentations will meet MDE re-licensure strands. Full Text: 21st Century Teaching and Learning Conference.